We had the pleasure of having my precious Mom here for just over three weeks. 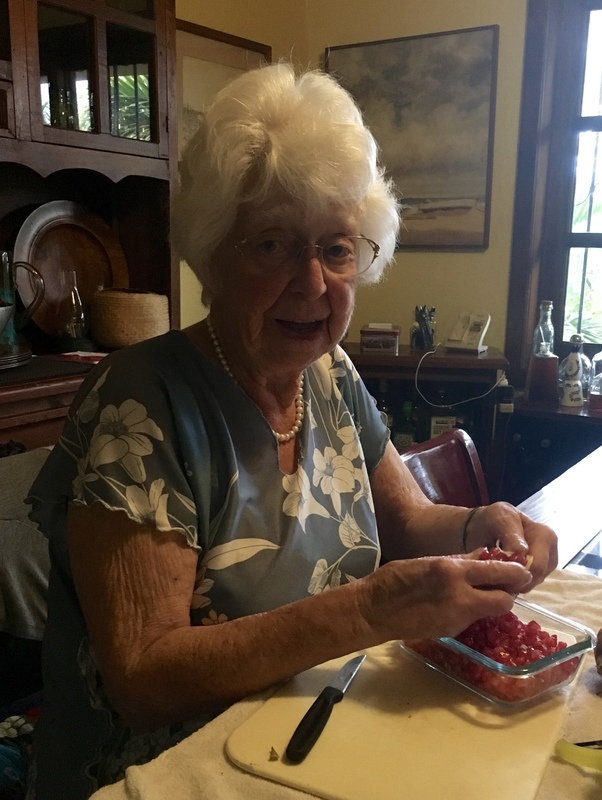 She wanted to contribute, so was given the job of checking the pomegranate trees for ripe fruit, then picking and seeding them (and a couple of other jobs as well, but not as fun as this one). We had a beautiful rain and, unlike most days when there are one or perhaps two ready, we had over a dozen bursting and ready to harvest the day following when the sun came out. We managed to give a few of them away, but Mom faithfully seeded the ones we were left with and put them in containers in the fridge for our consumption. Pomegranates are absolutely DELICIOUS when picked off the tree, as any fresh fruit is, and we kept Mom very busy with this task. I promised to make her a very famous Mexican dish called Chiles en Nogada, but we just ran out of time. I committed to practicing and making them for her next year and I made my first batch last night, inspired by a recipe from the Atlantic magazine by Rick Bayless. 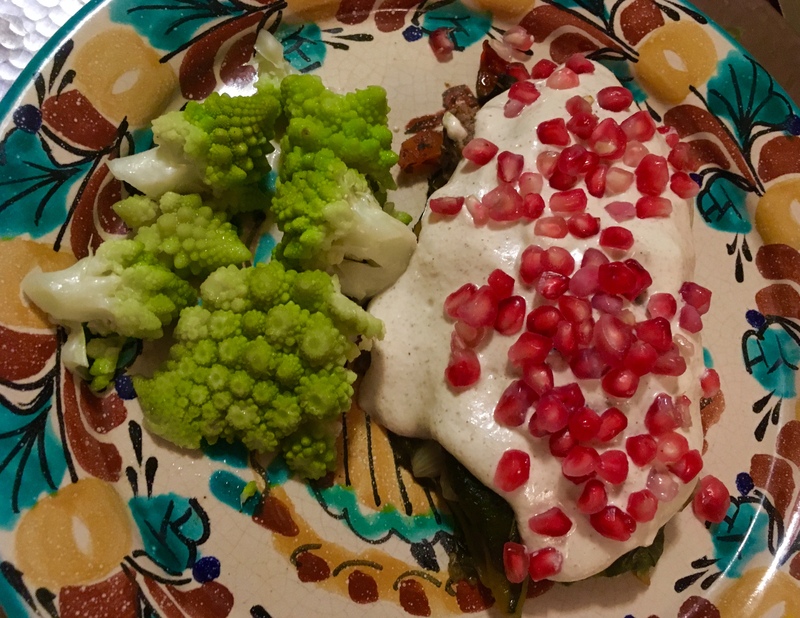 Traditional Chiles en Nogada originates from Puebla, is tied to the independence of Mexico, and celebrates the three colors of the Mexican flag: green from the Poblano chile, white from the walnut cream sauce, and red from the pomegranate seeds. This dish is usually served at room temperature, but I reheated the chiles, stuffed with picadillo (a mixture of ground lamb, fruits and spices), then topped them with the cold walnut cream sauce and garnished with the pomegranate seeds. I served the Chiles en Nogada with steamed romanesco, beautiful and fresh from the organic market up the street. This is definitely a time-consuming dish to prepare, but I look forward to making it for Mom next year when she visits. 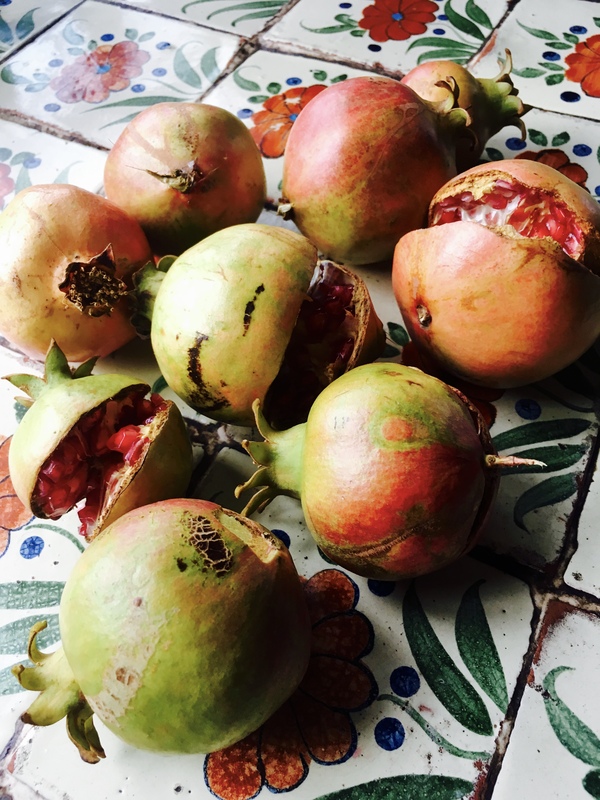 It’s the least I can do for all the pomegranates that she picked and painstakingly seeded for all of us to enjoy! Tagged Atlantic, Chiles en Nogada, fruit, Mexican, Mom, organic. market, picadillo, poblano, pomegranate, Puebla, recipe, Rick Bayless, romanesco, walnut.